After years of rumors, Ben Affleck is officially out as The Batman in the DC Extended Universe. Affleck gave the role of the Caped Crusader a fighting chance, portraying him in Batman v. Superman: Dawn of Justice, Suicide Squad and Justice League, before deciding that the cape and cowl were not right for him. It's unclear exactly what it was that ruptured the relationship here between Ben Affleck and Warner Bros. Pictures. It could have been the hectic schedule that kept Affleck from other projects, particularly with Justice League, which had an extreme amount of reshoots. It also could have simply been the fact that Affleck was probably more interested in pursuing higher quality roles, considering that all three of his DC movies bombed with critics. No matter the reason, Affleck is now gone, meaning that both DC and the fans need to be more focused on the future rather than the past. Considering that Batman is still one of the most iconic aspects of DC, there's no question that someone else will need to take on this role, especially considering that his next movie, The Batman, is only a couple years out. DC and Warner Bros. are surely already looking for a replacement to lead their franchise into a hopefully brighter future. With this in mind, here are 8 actors that we think would do great as the DCEU's new Batman. Unlike the other actors on this list, seventeen year-old David Mazouz has actually been playing Bruce Wayne for five years now in the hit TV series Gotham. While the role was introduced as a much younger Bruce Wayne, long before he decided to become Batman, this final season of Gotham will end with Wayne, now in his late teens, finally taking on the mantle of the Dark Knight to fight crime in the streets of Gotham. There are already rumors that DC and Warner Bros. are looking to show a younger version of the Caped Crusader in The Batman, so bringing Mazouz back for the movie may actually fit perfectly with their plan. It could serve both as a follow-up to Gotham and a unique addition to the DCEU. While Gotham isn't necessarily a huge hit, it does have a decent following of fans who would surely want to see more of its characters going forward. The younger brother of Thor star Chris Hemsworth and one of the stars of the Hunger Games franchise, Liam Hemsworth, may end up being a great choice to take on the cape and cowl. He certainly has experience with franchise movies, but is also not tied down by any particular franchise at the moment, meaning that his schedule for the next few years is conveniently open to take on this large role. While Liam is currently most recognizable with his facial hair, be it a grizzly shadow or a full-on beard, he would essentially look like a completely different person if he went completely shaven, which would make him stand out more as Bruce Wayne. He certainly has the dramatic acting chops to pull this role off, and arguably has enough star power to lead the DCEU for years to come. Liam Hemsworth has always felt like one of those actors with a lot of potential that has just not yet found the role to rocket his career. Perhaps Batman could be this role. Jeffrey Dean Morgan is actually already part of the DCEU, having portrayed Thomas Wayne, the father of Bruce Wayne, in Batman v. Superman: Dawn of Justice. This wasn't merely a one-off role for Morgan, however, as Warner Bros. initially planned for Morgan to return to the role in the cancelled Flashpoint movie, which would have featured an alternate universe where Thomas Wayne had become Batman, while Martha Wayne (Lauren Cohan) had become the Joker. Based on the current reports, it looks as though Warner Bros. is attempting to reboot the DCEU, with Suicide Squad 2 being described as a "relaunch," and The Batman obviously having to recast the lead role. Warner Bros. may decide to explain these changes by having the events of the new movies take place in an alternate universe, which would perfectly set up for Jeffrey Dean Morgan to return in a much more prominent role. For many years, Jon Hamm has been one of the top fan picks to play Batman, be it in the DCEU or elsewhere. He has the serious, yet cocky, acting style that is absolutely essential for Bruce Wayne, in addition to having a chiseled face that fits the comic-book Bruce Wayne to a T. Jon Hamm has even expressed interest in taking on the role. Here is what he had to say in his interview on In Depth. "It depends on the script, what the story is. I am a huge comic book fan, always have been. I've read comic books since I was 9 or younger. And I'm pretty knowledgeable about a lot of them. And I like the genre, and I like when they're done well." While Hamm went on to explain that all of the talk about him playing Batman was just rumors and speculation, it would still be great to see him in the role. He certainly has the resume for it, and would probably be interested in playing as the Caped Crusader for much longer than Affleck did. Darren Criss may seem like one of the most left-field choices on this list, but it doesn't mean he would be a bad choice for the role. Over the years, Darren Criss has proven himself to be a versatile actor, from his role on Glee to his performance in American Crime Story that just recently earned him a Golden Globe. If DC and Warner Bros. are really looking for a younger face to take on the role, Darren Criss would be a great choice. He is still in his early 30's and is still relatively unknown in the industry, while still having a full resume, which would keep many fans from having any bad blood with him. Similarly to Tom Holland as Spider-Man, Darren Criss could quickly rise in fame with the role, ensuring that the franchise can still have a big star without having to hire someone who is already a big star right off the bat. One of the biggest issues with Ben Affleck's casting was that most people only saw him as Ben Affleck rather than Bruce Wayne. With Darren Criss, this wouldn't be an issue. 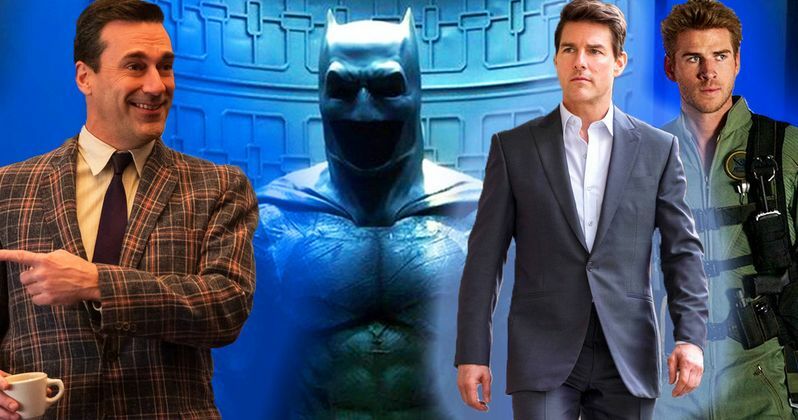 On the completely opposite side of the scale, Tom Cruise would actually be a decent choice for Batman. The obvious downside, much like Ben Affleck, is that everyone already knows Tom Cruise incredibly well, and his casting would likely spur a large amount of negative feedback. Outside of the backlash, however, there is no question that Cruise would be a phenomenal Batman. Cruise is known for giving his all to his roles, particularly in action movies like Mission Impossible. Having a Batman actor who isn't afraid to do his own stunts and really get into the role would certainly help the franchise and would make this particular superhero feel a lot more realistic, which would be a breath of fresh air considering that the superhero genre is over-saturated with CGI. Taron Egerton is yet another great young actor who could do wonders with the role of Batman. Egerton is probably best known for his lead role in the Kingsman franchise, though he has had some other great performances over the years in movies like Eddie the Eagle and Robin Hood. He is also starring in this year's Elton John biopic, Rocketman, which truly shows how versatile he is as an actor. Not only does Egerton have some good experience with action franchises, but he's actually not even held down by them at the moment. Egerton has seemingly stepped away from the Kingsman franchise, revealing that he will not be a part of Kingsman 3, which is seemingly the last modern day Kingsman currently being planned, which means that his schedule is a lot more open. Egerton already has a decent following and could help revamp The Batman as a fun and fresh take on the hero. Finally, we have Armie Hammer. Hammer would be absolutely perfect as the Caped Crusader, and we aren't the only ones who think so. Back in 2007, Hammer was actually cast as Bruce Wayne in George Miller's Justice League: Mortal, which aimed to be the first live-action Justice League movie. Unfortunately, like almost every other planned Justice League movie before 2017, Justice League: Mortal didn't make it to production, leaving Armie Hammer without the opportunity to wear the cape and cowl. Just because the movie fell apart, though, doesn't mean that Hammer shouldn't get to play the role. He has the perfect acting chops and facial physique to pull off both Bruce Wayne and Batman, making Armie Hammer our top choice to star in The Batman, assuming DC and Warner Bros. Pictures are smart enough to give this actor a second chance with the role.